2+2=4: The Dummy Candidate - Why Romney? "I have not heard any one blaming a 3rd party for mccains defeat. He is the only one responsible for that. No fight is why and the sucking up to Obama is the problem. It seems Romney has the same " Obama is a nice guy" syndrome. This traitor that is in the white house is the most dangerous this that this country has faced since pearl harbor." (c) sodomized/murdered American diplomat, etc., etc. - have you asked yourself, not how this could happen, but WHY? (we know how - through theft of the primary process) but WHY? Why did the elite destroy every semblance of grass roots democratic process, to run this loser? 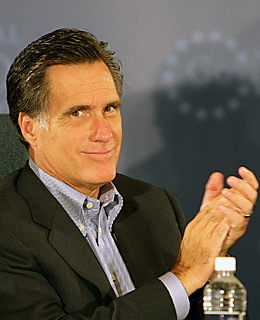 Almost all the others would have taken Obama to the woodshed, and Romney is incapable? Almost anything he can say in criticism of Obama redounds to his own life, religion and governing record - WHY did they "ordain" him? WAKE UP - The Republican Party has cease to be a force for the good, they are cooperating for our enslavement, and folk like you are empowering it.